Woot.com has the Excalibur Phantom Force Chess on a one-day special price of $69.99 + $5 shipping. Amazing, I never would have guessed that there would be more than a couple of hundred views. Re:Excalibur Phantom Force ELO Rating? "Selective Search rating est. 130 ECF/1640 Elo"
"Estimated ECF Grade: 150 / ELO 1800"
"ELO Hersteller: 1750, ELO SSDF 1400"
"Estimated U.S. Chess Federation Class A skill rating of 1900"
the Selective Search rating comes closest to my own estimation: 1650-1700. It will be interesting to see what the final ELO rating is for the Phantom Force. Below are the estimates I could find. It is odd that Excalibur does not publish a rating. 21. Nd5 Qc5 22. c4 Kg8 23. h3 f4 24. Nxf4 Bd1 25. Ne6 Rxf1+ 26. Kxf1 Qe5 27. 40. Kg3 hxg4 41. Kxg4 Rh4+ 42. Kf3 Rh3+ 43. Kg2 g4 44. Nxb4 Re3 45. Kf2 Rh3 46. The Phantom Force is a very popular machine. :- Not a casual victory, the new Phantom has a very weak program (it's only a toy?). In the next hours I'll leave the game here. I don't know the technical data: micro, ram, .... perhaps do you know it? I don't find the option "reply game"
I finally had a chance to play the Phantom (Black) against the Radio Shack 2150L (White). Both were set at 30 seconds per move. The 2150L won. The one I received from Skymall did not have a private label. Thanks for the info. Can you please confirm that the Skymall (Excalibur) version supports the same three speaking languages as the Sharper Image model, i.e. English, Spanish and French (no German)? No German - I confirm. Skymall.com shows their Phantom on "backorder. The expected ship date is 12/21/07." Does anyone know if they private label their version? So there will be three models at least. Actually, at least four models will be available, counting the one from Hammacher Schlemmer, if they private-branded it. Incidentally, their web site shows their model as "SOLD OUT, Due to the popularity of this item, we are unexpectedly sold out." I wonder how many units they sold. besides German language is missing from the EPF of the SI. As far as I can tell the Sharper Image badged model is exactly the same as the current Excalibur Phantom Force with the addition of the badge. Chess computers often have had badges or marks of marketing companies added to them which do not make a scrap of difference to the collectability and value. Examples being Quelle, CGL, Sandy, Competence.....Steve B is just being his usual mischievious self there TurboKing. There is no difference in collectability because the Sharper Image is an Excalibur Phantom Force, not a copy or a clone. At present there is no model with the German language that is available. Presumably that is a special model being produced for the German market. So there will be three models at least. Marginally the most collectable and more valuable one will be the German language one, I would guess. I would be willing to wager that the Sharper Image Phantom model is the same as the Excalibur 740D sold in the US. I'm not sure I agree with this statement. 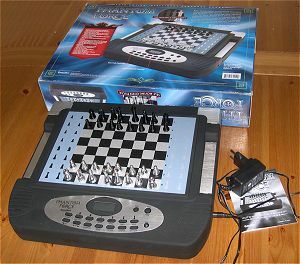 Old chess computers from Radio Shack are just as collectable as their corresponding models from Saitek, Scisys or other computer manufacturers.